The city of Antioch, and the Patriarchate which was centered there, continued its unhappy decline as the administrative centre of Eastern Christianity when it suffered a series of earthquakes, attacks and occupations by hostile cultural and religious elements. The city was captured and ravaged by the Persians in 538-540 and again in 611. After the Byzantine recovery of the area and the defeat of the Persians under Emperor Heraclius, Islam arose as a long range religiously motivated threat to the Christian Byzantine Empire. Antioch was one of the first victories of the advancing wave of Islam, falling in 638. Other famous Christian cities soon followed – Jerusalem, Gaza and Alexandria. The Moslem advance, and the various heresies precipitated a drastic decrease in the number of Orthodox faithful in the Patriarchate of Antioch, and impoverished the See materially. In 742, the occupying Caliphate made an attempt to further weaken Byzantine influence among its Christian subjects, when, it was forbidden to either speak or celebrate the liturgical services in any language other than Arabic; up until that time the Greek linguistic influence had been predominant as the common language of the Byzantine Empire. With the capture of three of the four Eastern Patriarchates – Antioch, Jerusalem, and Alexandria – the ecclesiastical role of the Patriarchate of Constantinople increased. This was quite understandable since it was, in a sense, the only free Orthodox See, existing as it did in the remnant of the Byzantine Empire. Many Antiochian patriarchs were appointed from Constantinople and even attempted to rule the See as absentees, resident in the Imperial Capital. The local Christian population of the Antiochian Patriarchate often remained virtually leaderless. After the fall of Constantinople to the Ottoman Turks in 1453, this tendency became more pronounced as the Turks recognized the Patriarch of Constantinople as the head of all Christians within the Ottoman Empire. This fact combined with the greatly reduced number of Orthodox in the Ancient Sees of Jerusalem, Antioch, and Alexandria reduced them to a position of virtual idleness and total dependence. In the tenth century Antioch was recovered by the Byzantines under the Emperor Nicephorus Phocas and some semblance of religious normality returned. The Turks captured the city in 1086, but their occupation was cut short by the invading armies from the West, the Crusades, which occupied the area in 1099. For the next 150 years the See of Antioch was reduced to imposed Roman Catholic submission. Under the guise of saving the Holy Land and its Christian inhabitants from the Turks, the Latin Crusaders forcefully replaced the Orthodox patriarch and hierarchy with those subject to the Roman Church. In 1154 Antioch was retaken from its Western occupiers by the Byzantine Emperor Emmanuel Comnenus who, allowing Latin occupation to continue under his overlordship, insisted that an Orthodox patriarch be returned to the Throne. This agreement to have the Antiochian Patriarch appointed from Constantinople did not last long and many subsequent Orthodox patriarchs of Antioch, such as the famous twelfth century canonist Theodore IV, (Balsamon), were unable to live under the hostile Latin occupation and remained either in Constantinople or in some other congenial location. Between the thirteenth and eighteenth centuries the patriarchs of Antioch were again elected and consecrated by the Antiochian Synod of local Syrian hierarchs. When the Mameluk Sultans of Egypt came to power circa 1260-1269, the Orthodox hierarchs were reinstated to the See of Antioch, but they were refused permission to return to the city of Antioch itself, and the centre of the ecclesiastical administration was permanently transferred in the sixteenth century to the civil capital of Syria, Damascus. By this move the Patriarchate of Antioch became more and more specifically indentified with the Christian Arab population, while maintaining its Byzantine Orthodox traditions and rites. The city of Antioch was greatly reduced in size by both natural disasters and foreign occupations, and its Christian population was reduced to only a slight fraction of its former size. At the end of the seventeenth and beginning of the eighteenth centuries the Patriarchate of Antioch was disturbed by upheavals and factional feuding. These divisive circumstances gave papal propagandists opportunity to make inroads throughout Ottoman Syria. The Jesuits played on the anti-Green attitudes of some of the Syrian hierarchs, and several of them accepted union with Rome. In 1720 Athanasios IV was elected to the Antiochian Throne and stifled these unionist attempts. Following his death in 1724 the monk Sylvester was elected as his successor, however a rebellious faction rejected this canonical decision and elected Seraphim Tanas, a nephew of a former uniate bishop. When Sylvester was enthroned as the legitimate Patriarch, Seraphim, (who had taken the name of Cyril VI), was deposed and fled to the Lebanese mountains. The Western European powers were anxious to develop commercial opportunities in the Middle East and thus gave their support to the Melkites, the schismatic uniate party. With the finalization of this Melkite schism, the Patriarchate of Antioch was again weakened, having lost churches, monasteries and many of its richest members to the Unia which offered them financial and commercial opportunities with the West. Further inroads and threats to the ancient Orthodox Faith of Antioch continued with the arrival of numerous Protestant “missionaries.” Throughout the nineteenth century the Antiochian Orthodox had to struggle against the well financed campaigns of both the Roman Catholic and Protestants propagandists. The Orthodox, however, also found a defender; not in the Western European powers as did the Catholics and Protestants, but in the Russian Empire and her sister Orthodox Church of Russia. Russian influence began to increase in the Middle East for both political and religious reasons. In 1848 the Russian Holy Synod gave the Church of the Ascension near the Moscow Kremlin to the Patriarchate of Antioch with the intention that the income from that church would go towards the education of the clergy and laity of the Patriarchate. Scores of men were sent from the Patriarchate to Russia for theological education, and several of these obtained prominent positions in the Russian Church as in the case of (Saint) Raphael Hawaweeny (later elected as Bishop of Brooklyn, New York) who was a professor at the Kazan Theological Academy. In the Middle East the Russian Church continued to assist its Arab Orthodox brothers through the Imperial Palestine Society which refurbished churches and monasteries, and established and maintained countless hospitals and parochial schools throughout the Antiochian Patriarchate up until the time of the Bolshevik Revolution. n 1899 the faithful and clergy of the Antiochian Patriarchate were successful in freeing themselves from the imposed Greek Hierarchy which had ruled Antioch since the eighteenth century. MELETIOS II (Doumani), a devout and learned Arab Orthodox, was elected to the Antiochian Throne. He was followed by the saintly GREGORY IV (Haddad) whose reign lasted from 1906 until his death in 1928. With the administration and initiative returned to the capable hands of its own people, the Antiochian Patriarchate experienced a reawakening from the dark hours of schism, political intrigue and foreign occupation. Patriarch ALEXANDER III (Tahan), who occupied the Antiochian Throne from 1930 until his death in 1958, enthusiastically set about to revitalize the parishes, monasteries and the theological seminary at Balamand. Perhaps the most important factor to consider in this spiritual renaissance is the Orthodox Youth Movement which was founded in 1942 by a group of dedicated laymen. The stated goal of the Movement is a renewal of the Patriarchate of Antioch through the study of Holy Scripture and increased participation in the sacramental life of the Church. To foster this renewal, they sought to encourage education among both the clergy and the laity. The founders were fully conscious of the fact that in spite of the hardships visited upon the See of Antioch, the Patriarchate had a great and glorious past and had made tremendous contributions to Christian theology, liturgy and spirituality. 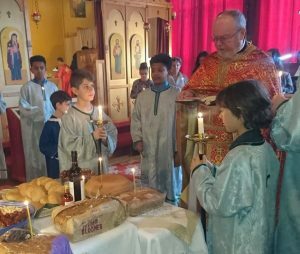 The Orthodox Youth Movement has proven to be in the best tradition of the See of Antioch and has given to the Church many highly educated monks and nuns (residing in monasteries established by the Movement itself), hierarchs, clergy and laymen. The successor of ALEXANDER III, Patriarch THEODOSIOS VI, (Abourjaily), led the Patriarchate from 1958 until 1970. In that same year the Antiochian Patriarch, His Beatitude ELIAS IV (Muawad) was elected and enthroned. He continued to oversee the renaissance and brought distinction to the Antiochian Throne by his own fiery faith, power of oratory and active pastoral and administrative ministry. The Patriarch of Antioch, (1979 – 2012), His Beatitude, IGNATIOS lV (Hazim), was born in 1921 in the village of Mhardey near Hama in Syria. He is the son of a pious Arab Orthodox family and from an early age was attracted to service within the Church. Whilst studying in Beirut, Lebanon, for a literature degree, he entered the service of the local Orthodox diocese, first by becoming an altar server, then a deacon. In 1945 he went to Paris where he graduated from the St. Sergius Theological Institute. From his time in France onwards he has been moved not only by a desire to pass on the deposit of the Faith, but also to take Orthodoxy out of its unhistorical ghetto by discovering in its Holy Tradition living answers to the problems of modern life. On his return to the Middle East, he founded the Orthodox Theological Seminary in Balamand, Lebanon which he then served for many years as Dean. As Dean he sought to provide the Patriarchate with responsible leaders who had received a good spiritual and intellectual training and who were witnesses to an awakened and deeply personal faith. Whilst his native language is, of course, Arabic, he also speaks fluent English and French. He was one of the founders of the very active Orthodox Youth Movement of Lebanon and Syria in 1942, through which he helped to organise and lead a renewal of Church life in the Patriarchate of Antioch. The movement worked at the heart of the Church helping ordinary believers to rediscover the personal and communal meaning of the Eucharist through a practice of frequent Communion which had become extremely rare. Following on from this in 1953 he helped to found SYNDESMOS, the world fellowship of Orthodox Youth and Theological Schools. “I know that I will be judged if I do not carry the Church and each one of you in my heart. It is not possible for me to address you as if I were different from you. No difference separates us. I am an integral part of you; I am in you and I ask you to be in me. For the Lord comes, and the Spirit descends on the brothers gathered, united in communion, as they manifest a diversity of charisms in the unity of the Spirit. As Patriarch he gave a new dynamism to the Holy Synod and had it appoint Bishops who were close to the people and who were motivated to develop the Church’s ecclesial and spiritual life, detached from political factions. Above all, the Patriarch sought pastors who were as dedicated to their spiritual calling as he was himself. Under its inspiration the Antiochian Church developed internationally and not least in those western countries who have found in the Orthodox faith their true home. The present Patriarch of Antioch is His Beatitude John X. His service began in a time of great upheaval and violence in the Syrian homeland of the Church. He has worked hard to sustain the faithful and help all the afflicted of whatever religion who have suffered and are suffering grievously in that country without neglecting to lead the Church forward in hope. At the end of June 2014 he convened the first International Conference of the Antiochian Church to address matters of concern and opportunities for renewal and development in her common life and witness in society. Under his capable leadership the see of Antioch remains strong and equipped even in very difficult circumstances to be a beacon of the gospel in the 21st century.